The saga of India’s cricket defeats in Australia continues. 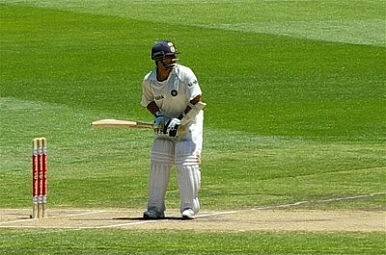 India lost the fourth and final test in Adelaide by 298 runs, with the hosts completing a humbling 4-0 whitewash. This was the 8th consecutive test match defeat, and the worst series of performances for an Indian team playing abroad since the 1960s. The only saving grace this time was that the team managed to drag this match out to the fifth and final day. And there were also some good individual performances from younger players such as Virat Kohli, who notched up the first century by an Indian in the series with a score of 116. For the more senior members of the team however – Sachin Tendulkar, Rahul Dravid and VVS Laxman – who are playing perhaps their last test series abroad, the Border Gavaskar tournament has been very disappointing. Question marks are being asked about the presence of Dravid and Laxman in the team, with mounting speculation that both players are now seriously contemplating retirement. But it’s Tendulkar’s failure that stands out. He has been trying to score his 100th test century for the last 11 tests, but has so far fallen well short. Criticism about his performance is still subdued in the Indian media, but one does need to ask what the value of greatness is if it can’t even come to the rescue of a team’s pride. Does the problem lie only with senior players? Had this been the case, then surely at least some of the younger players would have performed better. But in four tests, the youngsters have shown a remarkable lack of application. Shuffling the team and shunting out individual members is only putting a plaster over the wound. The fact is that the problem is systemic, and so should be addressed at that level. There’s no denying the fact that the first change has to come with the Board of Control for Cricket in India (BCCI), which looks after the game in the country. Over the years, the BCCI has become a corporate outfit, whose sole motive seems to be profit and the well-being of individual players. Deliberate preparation of slow wickets, regional bias in the selection of players and the dominance of the board by people from non-cricketing backgrounds are the hallmarks of the present set-up. However, it’s not only the upper echelons of Indian cricket that need to be toned up. Each region in India has its own team, and they play against each other every year. But what is missing is competitive rigor. How can we think of preparing a truly national team in this haphazard manner? How can we hone skills and talent in the absence of a proper physical and administrative structure? There’s so much group-think and politics at the BCCI that most of the selection and preparations are done on the spur of a moment. This weakness gets reflected every time we travel abroad – it happened last summer when the Indian team visited England, and has happened again in Australia. And the failure in the international arena is affecting the country’s image and self-confidence. Sporting success helps shape the national narrative – it can provide inspiration and strength for the country while promoting greater unity. So, will the defeat in Australia serve as a catalyst for change in cricket in this country? Sadly, past experience suggests that the BCCI will make scapegoats of some players, and then it will be business as usual. Sanjay Kumar usually blogs at Indian Decade.